Myth #1: An itchy head means your child most likely has head lice. While itchy scalp is a common symptom of head lice, other things can cause an itchy scalp, such as seborrheic dermatitis (dandruff) or dry skin. Moreover, some children who have head lice may not experience itching. Myth #2: Bad hygiene, poor grooming habits or a messy home can increase the likelihood of getting head lice. Head lice has absolutely nothing to do with personal hygiene or how clean someone’s home is. In fact, washing a child’s hair will not get rid of lice or nits (lice eggs), which cling to hair. Over-the-counter treatments for head lice are available in two forms: shampoo or cream rinse. Follow directions carefully to ensure successful treatment. Remove dead lice and nits with a fine-tooth nit-removal comb. Repeat application of the anti-lice medication within seven to 10 days of first application, to kill any lice that may have been missed during the combing process. Myth #3: Head lice prefer long hair. It doesn’t matter if hair is short, long, clean or dirty. 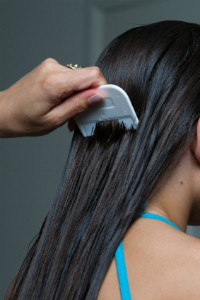 Lice thrive in hair, period--specifically on the blood they get through the scalp. Myth #4: You can get head lice from pets (and vice versa).